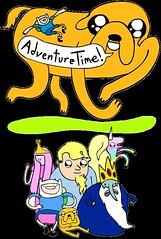 So many fans love the music on Adventure Time. And while we can’t help out those of you who have asked about a soundtrack CD (not in the works, as far as we know), we can post this often-requested track from “When Wedding Bells Thaw.” The show’s composer, Casey Basichis, wrote this: “That was my buddy Tim Kiefer’s track, he is officially working with me this season. We’ve been working together for ten years, he’s a brilliant musician.” So, thanks, Tim. And thanks, Casey. So we’re putting together a list of some favorite lines of dialog from the first season, and “we need help our business.” Any short, excellent sayings you particularly dug? Thanks a ton (and a big thanks to everybody who weighed in on the earlier post re-capping season one; it’s much appreciated). Cute alert! 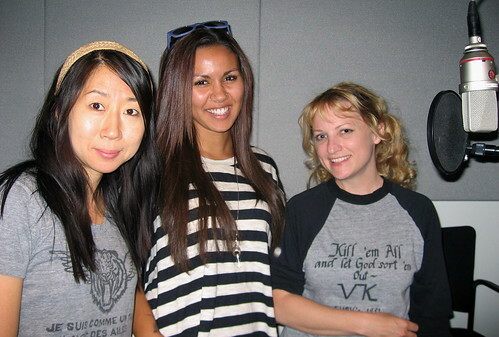 Niki Yang, Olivia Olson, and Hynden Walch record as Lady Rainicorn, Marceline, the Vampire Queen, and Princess Bubblegum at Cartoon Network in Burbank. Even though we’re nearing the end of second season in recording, this was the first time Olivia even met Niki and Hynden. Go figure. It’s tough to fathom, but season one of Adventure Time is history. Last night’s “Gut Grinder” was the final debut of this first batch of 26 eleven-minute episodes. So, assuming you’ve seen at least a good chunk of them, what did you think? Favorite episodes? Disappointed with anything? Characters you want to see more of? Less? Who would like Finn & Jake to deal with real life problems like the ones you face every day? And who would like to see them do just the opposite, getting into far-out situations involving robots and magic powers? Here’s an episode re-cap, sorted by their half-hour pairings. So many amazing & diverse Adventure Time fan-art / food today! And now LEGOS! 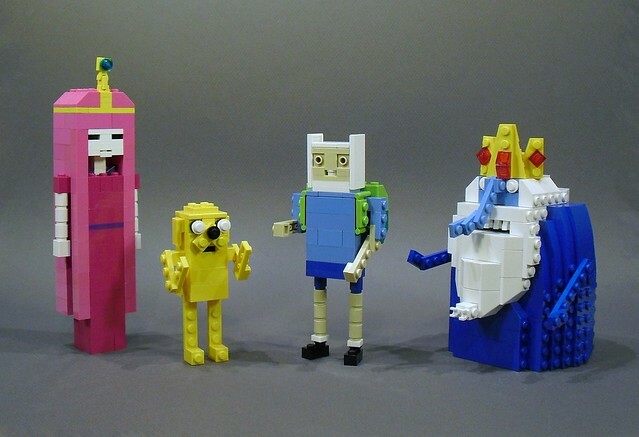 Check out these amazing AT Lego renditions by Iain Heath. 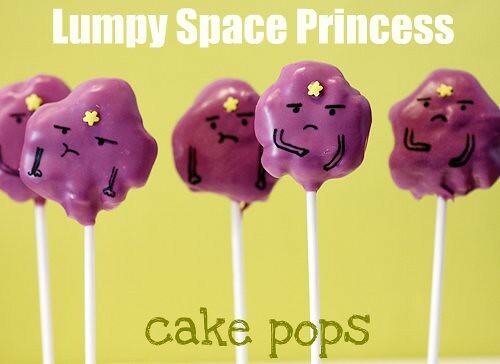 Click on the picture above to check out Amanda Krueger’s awesome Lumpy Space Princess Cake Pops! 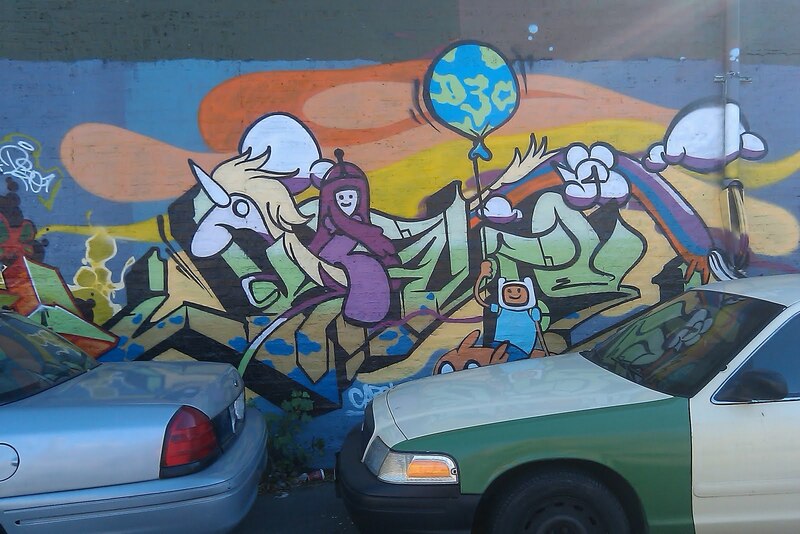 Check out this radical AT graffiti art! Artist is unknown, but the picture was taken by banjaloupe! “Gut Grinder’s” prop designers were Phil Rynda, Natasha Allegri, and Tom Herpich. Character clean-up artists were Mike Collins and Alex Campos. Ron Russell and Simon Simmonds were the colorists. Nick Jennings is the show’s art director, and Pat McHale is the creative director. 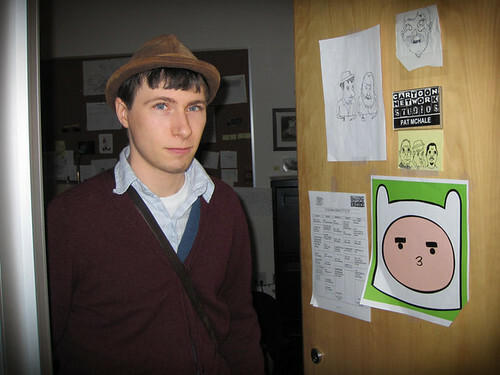 Pat’s been Adventure Time’s creative director and Pen’s right-hand man since before production began seventy-two years ago. Well, he’s giving up that post today as he and his (also very talented) filmmaker wife, Jiwook Kim, are escaping L.A. and heading off to the east coast and all things Mayberry. (He’ll still be calling in for writers’ meetings, though, no doubt cranking up the phone from atop the nearest telephone pole). 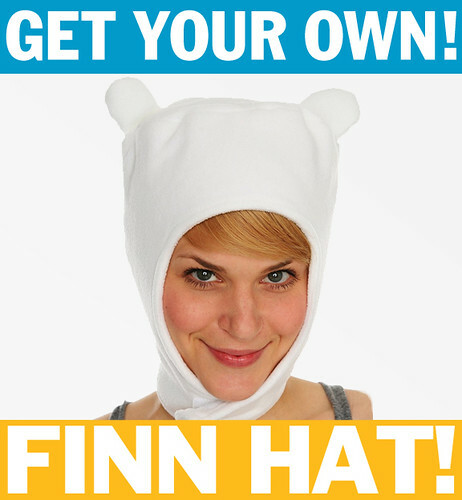 No one is indispensable in this business, but when it comes to Adventure Time, Pat really is. We - and you - have been fortunate to have him on the team these past years, and we can only hope we’ll be working with him on his own projects somewhere down the road. Thanks for everything, Pat. Best of luck to you and Jiwook. “Gut Grinder” premieres this Monday on Cartoon Network. It’s the final episode from season one. Phil Rynda designed and Paul Linsley painted the title card under the supervision of Nick Jennings.